These cookies were just that: on the fly. I hadn’t planned them out, I didn’t even have a recipe, so to speak. I just followed my feelings and felt along. 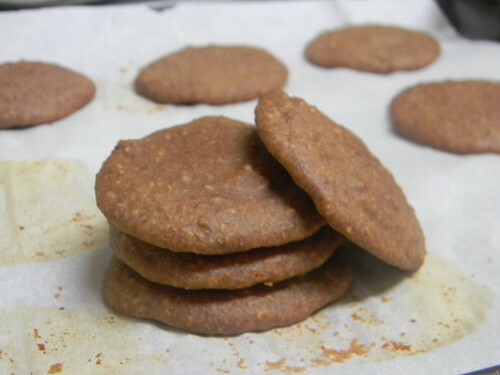 I was going to make some kind of olive oil cookie, actually, but then after I opened the bag of cocoa powder and I caught a few whiffs of it, I knew I wanted chocolate. Before my family changed our diets to help my brother, I remember how much I loved chocolate. We’d be in the candy aisle and I almost always left with a chocolate bar. After it was gone, I’d want more. Since we’ve been SCD, though, strangely I don’t crave chocolate so much – in fact, I’m quite good without it. I don’t crave it. And when I do want chocolate, it’s usually dark chocolate or something I’ve made as chocolate desserts, such as from a bakery, I don’t really enjoy that much or they don’t tempt me anymore. Don’t get me wrong, though, I still like chocolate! I just don’t get cravings for it. I definitely feel I could improve these cookies. The chocolate flavour is understated – though now I’ve just said that (“understated”), it does sound kind of decadent, doesn’t it? [Update] These cookies actually taste like one of the chocolate/cocoa Larabars! I feel that if you wanted the chocolate flavour boosted, I’d increase the cocoa powder by an extra two tablespoons, making it a quarter of a cup. As these are not a very sweet cookie, they could be eaten with some icing or a condiment of your choice if you don’t want to eat them plain. 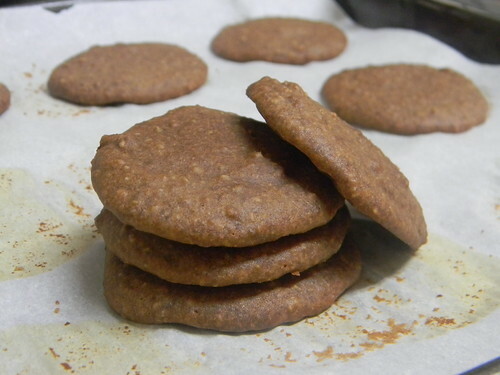 They’re also that kind of cookie that’s good eaten with or washed down with a glass of milk (in this case, a dairy-free milk such as almond milk). Stir the dry ingredients together in a small or medium bowl. Mix in the coconut milk and beaten egg, until balls of dough start forming. Add the rest of the ingredients, one at a time and mixed well before each addition. The dough will graduate from a thick dough to a batter. Cover and refrigerate for 15 minutes to thicken the batter. Spoon heaping teaspoonfuls of batter per cookie on the prepared baking sheet, spacing about an inch apart. Swirl around the drop of batter to spread the cookies as they will not spread while baking. Bake for 12 minutes. Remove from oven and cool. Enjoy! oh yum, these look great! if only my “spur of the moment” cookies ever came out so well…. awesome job! If you want to enhance the chocolate flavor…maybe add in some carob chips?? Thanks, Jenn! Carob chips may work, though I’ve seen roasted carob powder, which I’m intrigued about. Anyone tried it? If you do try these out, Iris, let me know how they are! Since realizing they taste like a cocoa Larabar (as I’ve updated in the post), I’ve warmed to them even more. They’re good fresh out of the oven but if you leave them out overnight, uncovered, they also become a bit firmer – how I like them. After that, though, I think they should be stored in an airtight container or covered so that they don’t get any harder. Thank you, Ricki! Yes, understated – especially when it comes to chocolate – can be good, too. Zoe, I love everything about these cookies! And, I haven’t even tried them yet. 😉 I have all the ingredients. Those are my favorite recipes … the ones that require ingredients that I always have on hand. Because my all-purpose gf flour mix is simply Asian white rice flour and cornstarch, I can just sub that for the total of the white rice flour and cornstarch. I might add a tiny amount of coconut sugar for a tad more sweetness and additional flavoring and texture. These actually tempt to turn on the oven despite the heat! Thank you, Shirley! Yes, those recipes where everything’s already on hand are my favourites to; this recipe was just that, too; I simply worked with what I already had or whatever I had left on hand, improvising as I went along. Regarding the heat, when I bake I try to do it early in the day when it’s generally cooler or in the evening. It was an overcast day when I made these cookies, so it was perfect. Wow, these sound tasty! I could go for a few myself. These cacao enriched GF cookies look like the real deal!! I love the flavours you haves in here!